InsideDirtRacing.com will be providing live updates from the opening night of the World of Outlaws Morton Buildings Late Model Series Winter Freeze IX at Screven Motor Speedway in Sylvania, GA on Saturday night, February 9, 2019. The updates will be provided by Richard Allen(@RichardAllenIDR on Twitter). Classes in action: World of Outlaws Morton Buildings Late Model Series for $10,000-to-win(50 laps). *Please Note: These updates will focus solely on the WoO Late Models race. **Cell service at Screven can be a little sketchy at Screven which could limit the live updates. 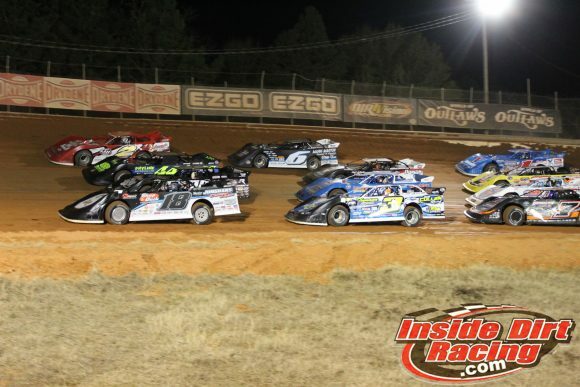 This is the opening weekend of the 2019 WoO Late Models season with two events to be held at Screven Motor Speedway. The drivers meeting is scheduled for 5:00pm. Weather is expected to be cool with no chance for rain. Mike Marlar was the 2018 WoO Late Models champion. The drivers meeting is slated for 6:00pm with hot laps to follow soon afterwards. Brandon Overton won on Friday night at Screven. 6:15- Track prep almost completed. Hot laps for all classes to begin soon. 6:35- WoOLM hot laps about to roll out. Photos: I often post pictures on my @RichardAllenIDR Twitter account if you would like to take a look. Qualifying Results: Drivers will be divided into two groups for qualifying. Heat Race Results: There will be four heat races with the top-4 from each transferring to the feature. Each heat race winner will go to a redraw to determine starting spots 1-4 for the feature. Each heat race second place finisher will draw for spots 5-8 in the feature. Last Chance Showdown Results: There will be two Last Chance Showdowns with the top-3 transferring to the feature. 9:21- Feature rolling out. 50 laps for $10,000. Lap 48 caution. Covert and Dillard crash racing for third.